On 13 May 2003, the Glamorgan Business Centre, University of Glamorgan was the venue for Professor Janet Wademan's Inaugural Professorial Lecture. 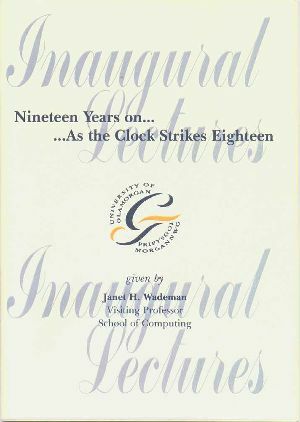 Entitled: "Nineteen Years on ... ... as the Clock Strikes Eighteen", the lecture recognised that we are rushing onwards in a world of rapid technological change. It illustrated the convergence of past, present and future. "Nineteen years ago we passed Orwell's futeristic milestone and we now find that those once alien pages are taking on a familiar feel. Is technology going to be the tool of the few locking us into an outdated factory mentality and turning us into its slaves? Or will we use technology as an egalitarian catalyst for change? With a breakdown of both inter and intra community trust we find more and more that ICT tools are being developed as a substitute for trust. Will virtual agents become the police of the 21st century? and will they reassure us or control us? As new technologies become ubiquitous will the question of 2050 be: are we about to enter the world of Wil McCarthy's David Sanger?" Three inter-related vignettes: Death of Distance, Replacement of Trust and Growth of Knowledge were used to explore huge sociological and economic implications that ICT has had, and will continue to have, on the lives of individuals and organisations worldwide. The lecture was formally introduced by Deputy Vice-Chancellor, Professor Les Hobson, University of Glamorgan and the chairing of the Question and Answer session and vote of thanks was given by Professor Peter Hodson, Head of the School of Computing, University of Glamorgan. A full transcript can be provided on request, please send an e-mail giving: your name, address, organisation, role, research interest/(s), e-mail and telephone number.